This is a remake of a stupid idea I had when I was about eleven, which we all know is excellent fodder for KoTM entries. Is probably full of glitches, and requires cncs232.dll to run. Undocumented feature: if you press F on the keyboard, the game goes to the results screen instantly. This is a debug feature that I forgot to take out. Yeah, probably that. I'll update the description so that's in there. I think this could be really good if you made it so that the fire effects the ball, but not the bricks; made it so my paddle wouldn't scroll off the screen; and made it two player. Or am I just not doing something right to get it multiplayer? I thought it was going to be a race to destroy the wall, maybe that would be a good mode to add. 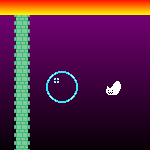 Also a 'growing wall'--an equivalent to the 'falling wall' option in Moraff's Blast would be a really ace mode too. And maybe the bounce randomiser is doing funny things to me. I will steal your idea, and do all this myself if you're not interested!